Children in the UK know more about the developing world than ever before. Some of what they hear is exceptional, with brutal conflicts and spectacular natural disasters grabbing headlines. Fortunately, schools try to give a more complete view of life in poor countries, even if learning about major social problems– poverty, malnutrition for example –inevitably paints a rather bleak picture. When I was asked recently to talk to primary school pupils, I decided to focus on a tropical food crop. I chose cocoa. Everyone likes chocolate, especially children. My aim was to explain how the plant was grown and beans were produced and sold, discussing the people involved at different stages in an attempt to explain why agriculture is so important. 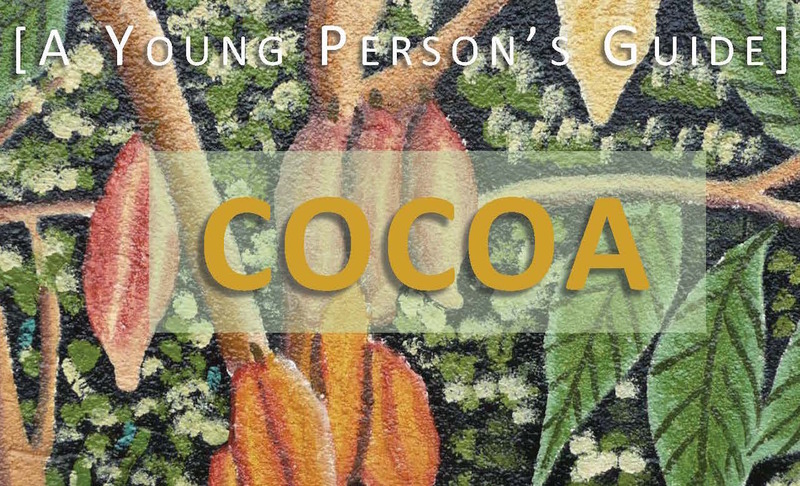 In a small town 100 miles north of London, I reckoned few if any in my class of ten year-olds would know the cocoa plant. But I checked before starting the two-hour session, just in case. 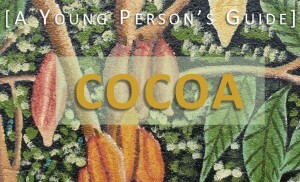 Sure enough, one girl had seen a cocoa tree in a greenhouse in a botanic garden. We began by making a long list of things that contained cocoa, including cocoa butter. We then discussed countries where cocoa was grown, using maps I provided. 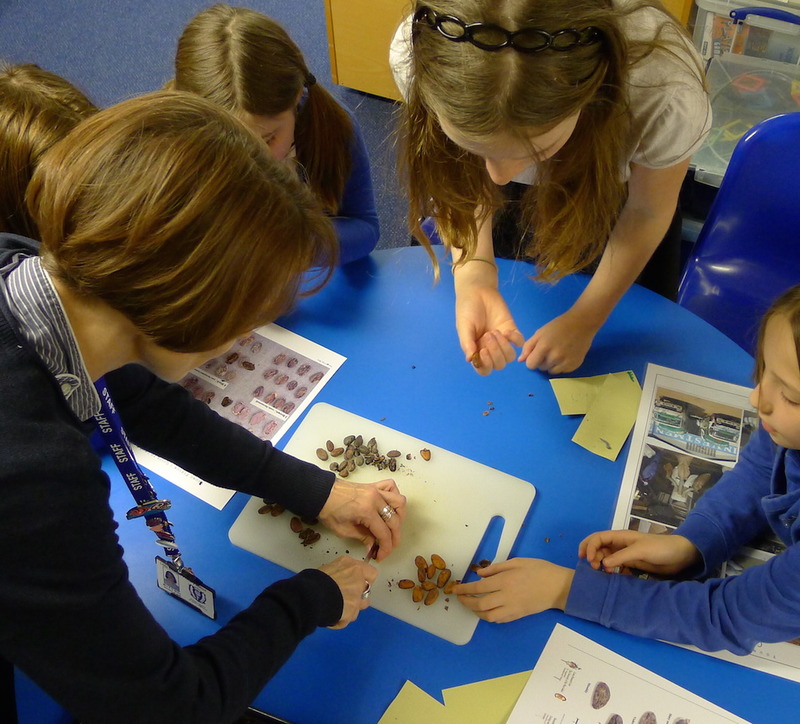 The children quickly realised that cocoa grows close to the equator, because, as one girl said, “that’s where you get tropical rain forests – and they store lots of rain”. We went through the list of cocoa-producing countries. No one had heard of Guatemala, but several boys knew about Togo, because of another more famous export: professional footballers. I planned an illustrated journey, going in stages from planting seed to producing cocoa beans, first showing large pictures on a screen before getting the children to look more carefully at photo-sheets. We began with photos of different cocoa gardens, one well-tended, another in decline and one with dead and dying trees. Next, we did seed to pod and then pod to bean. The children asked good questions about planting, flowering, pod production and shading of young cocoa plants with bananas and other plants. I brought out three cocoa pods and said we were going to look inside. Eyes widened as the children carefully cut open the pods, exposing a perfect sequence from unripe to ripe and over-ripe pod (this was more luck than judgement). Handling the pods sparked the children’s curiosity, and they asked more questions: how do you know when the pods are ripe? They change colour. How long can you keep a pod after you’ve removed it from the tree? About a week. The children tasted the flesh surrounding the beans in the ripe pod, pleasantly surprised at its fruity flavour. A few nibbled at the beans, equally surprised to discover these did not taste of chocolate. We moved on to the next sequence of photos: from pod to bean, then bean to truck. The children learnt about fermentation and drying, the challenges of selling and buying beans, and moving 63 kg bags from DR Congo to the port of Mombasa in Kenya for export, a journey that takes about two to three days by truck. The children also cut open some dried beans. They graded them, as a buyer would do, then cut them open to check the quality, using a colour chart – as a chocolate maker would do. In two hours we’d gone from growing cocoa to exporting beans. Along the way the children had seen farmers in action, where they lived, the clothes they wore, and learnt about the importance of cocoa as a major source of income to nearly 30,000 farmers in DR Congo. Today’s children are tomorrow’s leaders, and in a world where people are far removed from the source of their food, it is vital that we help people in the North understand the importance of agriculture to people in the South, and the need to help farmers succeed. Better yet, while stimulating young minds, to allow children to taste the real flavours of the South. 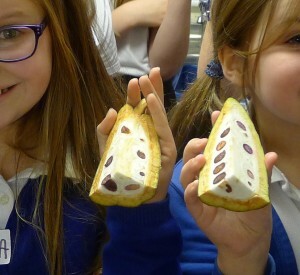 My thanks to Marianne Quinsee and Toni Boa of Little Bowden Primary School, Market Harborough, for enthusiastically supporting the visit, and to Andrew Daymond of the International Cocoa Collection at the University of Reading for providing the pods and beans.